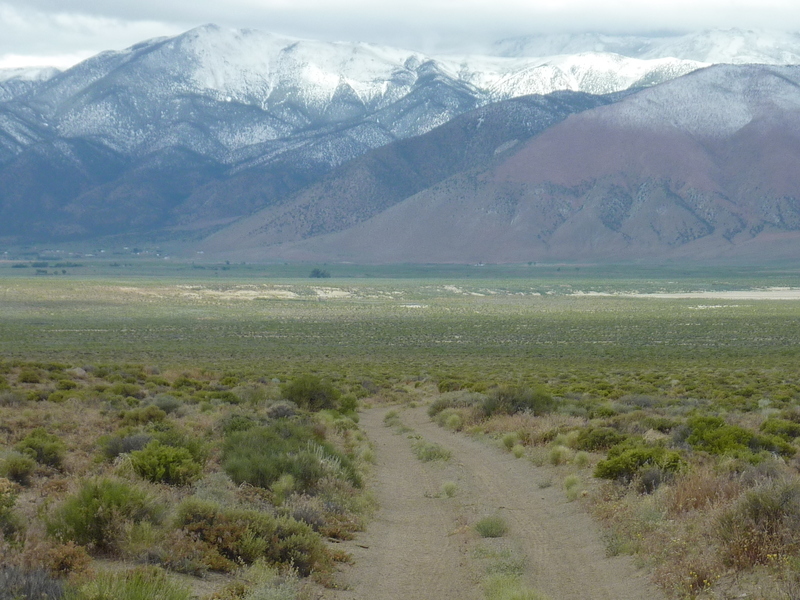 I spent most of the day tooling around the Singatse Range in West Central Nevada, separating Smith and Mason Valleys. The weather system that had dogged us the previous day came back for even more, leaving the higher summits above 6,000ft with a dusting of fresh snow overnight. It had been 38F when I went to bed at 11p the night before, but warmed to 42F when I got up around 6:30a. The weather would continue to threaten in the early morning hours, but would let up as the day wore on. By evening the clouds were mostly gone, leaving only the strong winds which had been blowing almost continuously for the last three days. I finished a little earlier than usual so I wouldn't miss game 5 of the NBA Finals. I'm not much of a sports fan outside the Tour de France, but since I've been watching the Warriors during the playoffs, I've gotten sucked into it. I was happy to see them finish off Cleveland to allow me to go back to focusing on the important things - like more peakbagging! This P1K is the secondmost prominent summit in the range after Mt. Wilson. Located roughly in the middle of the range, it's about 4mi from either SR208 to the east in Mason Valley or somewhat less from the dirt Delphi Rd on the west side. A high-clearance vehicle can get more than two miles closer on the west side but they were not suitable for the van and I found myself on foot starting from Delphi Rd (it would have been far less driving had I just climbed it from the east side at SR208). I followed a sandy jeep road to some old mine works, getting me within a mile of the peak. From there the cross-country travel goes steeply up open terrain all the way to the top. As seems to be the norm around these parts, a very large cairn occupies the high ground overlooking the two major valleys on either side. The wind was strongest here making a thorough search for a register somewhere among the many stones difficult. Finding none, I left one on my own before starting down to get out of the brunt of the wind. I descended an adjacent ridgeline to the west of the one I went up, bypassing the mine works and rejoining the jeep road back down in Smith Valley. The 6.5mi outing came in at just under 3hrs, getting me back before 10:30a. On my way back out on Delphi Rd to SR208, I happen to notice this one on the GPSr as I was driving by. There was a rougher dirt road forking towards it 1.25mi away. I decided to get out the bike I'd been lugging around in the back of the van, having mixed success. Various roads can be used to get close but they tend to be either sandy or rather rocky. I made the best of it, but abandoned the bike about half a mile from the summit. The walking was fairly easy and more relaxing, too. I found a cairn and the expected benchmark and enjoyed the views from the modest summit. It happens to be located almost dead-center in Smith Valley so one really gets a 360 view of the valley with the snow-tinged Pine Nuts to the west looking more wintry than one might expect for mid-June. I drove back out to SR208, making my third trip through picturesque Wilson Canyon in three days. The West Walker River drops 150ft in about 3mi from Smith Valley into the south end of Mason Valley through this narrow gorge. The water is only a few feet under the roadway and roaring at full spring melt. The local fire dept has sandbags available for potential flooding events. Back in Mason Valley I drove north on SR339 for a few miles until I was southwest of Black Mtn. It lies a few mile north of Mt. Wilson and had caught my attention the day prior. With more than 700ft of prominence, it stands out in its own right and makes a worthwhile objective. Or at least that's what I was figuring when I started out. There is a jeep trail that I followed up the canyon south of the summit, but once I left the coziness of the gravel roadbed to start up, I found the going somewhat tedious. Dark volcanic rock is strewn about all over the place, some of it hiding among the dry grasses and it took much concentration to make my way up the slopes. Ugh, ugh. Of the four days so far, this was the least enjoyable summit. The top is crowned by not just the usual large cairn, but a trio of them, perhaps in compensation for the effort required to reach the summit. I left another register here before starting down, looking for a shorter, hopefully easier route. Shorter, yes, but not fun on descent either - plenty of sand but again more loose rock than one would choose. The 3.5mi outing took 2hrs, returning me by 2:30p. This last one in the northern part of the range is located less than a mile from Mason Pass Rd. The road was washboarded in places, but passable by any vehicle. I drove into the strip mine located south of the summit in order to get me within about half a mile. Better vehicles can drive much closer, and a Jeep could make it to the summit. There is a large wooden cross embedded in a cairn and the tattered remains of a flagpole at another. On my way back down I picked up some cool green and blue colored souveniers to add to my rock collection at home.